Happy New Year Everyone... and wishing you all the best for 2011. Also, I had received Chadwicks Fall catalog some time ago and fell in love with a few of its dresses, two in particular were the Colorblock dress and the Shapely Dress. As always I gravitate to Butterick's Lifestyle Wardrobe patterns, and I've managed to purchase several of the patterns from that collection despite them being OPPs. 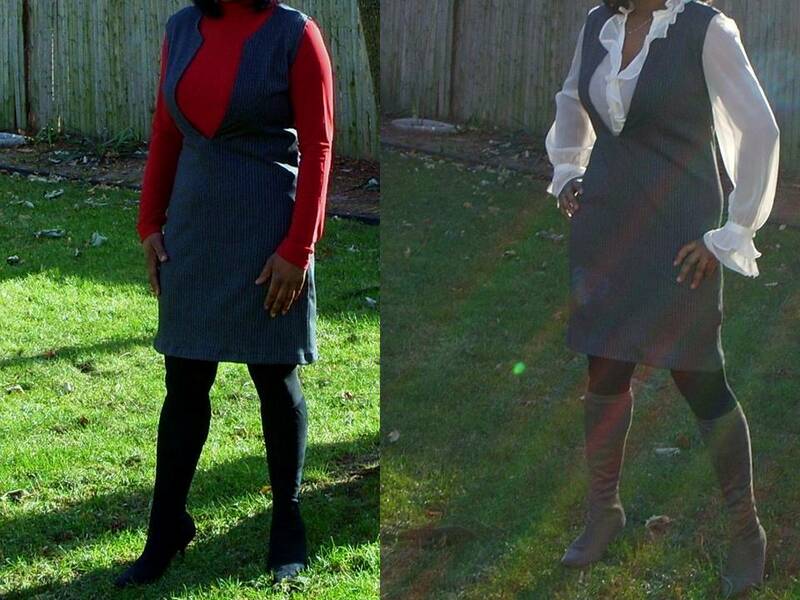 For my inspiration dress, I used Butterick 5146, which consists of dress, tunic, jacket, camisole, skirt, pants, & belt. I made a jumper from that pattern 2 years ago and the outcome involved a lot of laughter. I'd paired it with a ruffle blouse and my daughter said I looked like Madam Lancelot. For my inspiration dress I used a medium-weight print knit from Sav-a-thon. The dress also involved a bit of fiddling. I had added darts to the front & back to take away the shapelessness of it, but after basting the dress together noticed the darts were too high and had to re-mark them. Then there was the issue of removing excess from the side seams. When I cut this dress I'd added an 1/2" to each piece due to all the holiday eating, but then couldn't understand why the dress was too big. In thinking back when I made the jumper and of course remembered too late, that pattern was a size 16 and I had only made adjustments to the dress instead of the pattern pieces too. Finally, realized that if I gone with the pattern pieces as is I would have avoided the heartache of removing so much fabric from the seams. Lastly the sleeves, had to reduce the circumference to closely resemble my inspiration dresses and used a sleeve pattern piece from a blouse as a template. Unlike my first take on this dress, this time I used the facings. All the seams were serged and in keeping with the colorblock dress, I added a block of color to the hem line using blanket binding. The hem line is off a bit, when I sewed the blanket binding I failed to pay close attention to line of print, but as always, its not a deal breaker. Enjoy the rest of the Weekend and have a great Week. Happy New Year Girl. Your dress is too cute. I love the border on your dress. Happy New Year, I love the hair! Oh, and the dress, too! It looks fantastic with the boots. Very chic. It looks like u can play with how u can style it. The shape of this dress is fabulous! Your work at fitting it definitely paid off. It's perfect. Happy New Year! Happy New Year! I think it is a great retro chic look indeed. What a great dress and a great way to start off the new year! Happy New Year. Your dresses look amazing. Brilliant. It all came together and your daughter loved it. Bonus. I quite like the pirate look and your new dress is grest too - classic! That's a wonderful dress, and love the accented hemline. A very happy new year to you Sheila! Another great dress! Keep up the good work! Super cute dress. The slippers are McCalls 4979,I followed the pattern, just added an additional layer of batting but I would really like to find some type of foam to use. Thanks for your comment. Wow! You look amazing! Love that dress. That black at the hem adds just enough "something" to make this dress really special. All of your tweaks to the pattern paid off big time - the final dress is fabulous! Great fit and it looks like a perfect dress to throw on when you need to look good, but feel comfy. Nice work! I love the dress and it fits perfectly! Happy New Year! Happy New Year Sheila!! I wish you the best too! Always love to see you work! Happy New Year, Sheila. Your off to a great start with your 2011 wardrobe. Cute mode dress. I'm a fan of the Butterick wardrobe patterns too. I just need to sew more of them. Lol Have a prosperous year doing what we love to do, create beautiful things. I agree it's very "Chic" and looks beatiful on you pair with those knockout boots!! I also loved the jumper too with the white blouse, I would wear that now!! Awesome dress and love it with the boots - are those Nine West? The blanket binding is a nice touch. Aren't kids honest with their comments? Lucas told me my camo fleece was "out there," whatever that means! That's a fantastic looking dress, you look amazing in it! Don't you love the fact that daughters are so straight forward with their mother's wardrobe,haha...As always, you look fabulous.